Mercedes Benz Fashion Week 2018 has secured the debut of the much-desired leather goods artisanal brand Deadly Ponies. Specialising in handcrafted luxury handbags and wallets it also launched a leather jacket in 2017 suitably called 'The Pony Rider'. Following this was a leather accessories collection released for Hasbro's My Little Pony franchise which proved to be one of the most successful collaborations for the Deadly Ponies label. The brand was established in 2005 by Liam Bowden who originally designed and produced his creations from his home garage. He learnt to print on leather and started to create leather goods as a past time. Selling leather zip purses at a local market held within his university, he was also freelancing as a graphic designer. People began to request to purchase more of his crafted items to a point it was evident it was no longer a hobby and now operating as a business. With business growth, Bowden decided to surround himself with a team of experts and along with his partner Steve Boyd created a burgeoning business selling luxury leather accessories mainly in an Australasian market but also in selected boutiques across the world. The handbags of Deadly Ponies are widely coveted, stylish, functional and designed with quality. The latest capsule Winter 2018 collection celebrates materials and the method of creation. Within this capsule collection is 'Python' a series which includes, a vertical clutch, a brass buckle classic thin belt, and Mr Woolf a brass buckle hand bag with suede lining. 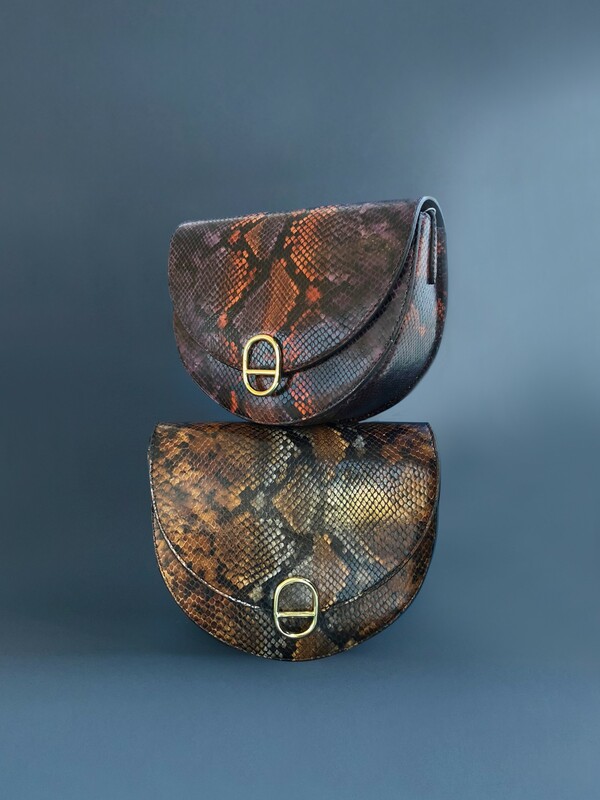 These pieces are made from luxurious Capra Python leather crafted from goat hide which have been through a process of colour wash which recreates the texture of natural python skin. The final process is the cutting of the top layer to produce the scaled, flaky, textural feel. Deadly Ponies has taken a strong social responsibility position choosing to work with production partners and suppliers who uphold stringent manufacturing ethics. The vision and care in building the 100% New Zealand-owned enterprise has helped the label build a strong knowledge of, and belief in, how it should conduct their business, and what the responsibilities are to their staff, contractors and the community. Their farmed deer leather is sourced from companies where all leathers are sourced by natural casualties or are a by-product of meat production. This same company supplies to Gucci, Louis Vuitton, Prada and Hugo Boss. Though Bowden remains humble with the brand's success, it’s beautiful pieces are favoured by the likes of Charlize Theron, Eva Longria and singer Lorde. Bowden pushes boundaries by challenging traditional notions of design and continually creating stylish and quality products. There is much anticipation for this debut presentation which will be seen during the MBFWA on Wednesday 16th May.